30 Nov My Garmin Died… Where Am I? For cycling navigation, I used to ride around the Yorkshire Dales with an Ordnance Survey map in my jersey pocket. It was a clumsy affair. I would study the map before the ride to decide on my route. But I never was able to remember more than a few turns if I went on new roads. No one I know now resorts to carrying paper (laminated or not) maps on their rides. Many, probably a majority, of riders have GPS devices, little satnavs that mount on their handlebars for cycling navigation. There are a lot of different makes and models, though Garmin seems to be the most popular. It is popular enough that people often refer to these devices generically as having a “garmin” with them. That is whether or not the device is, in fact, from that company. Whoever makes them, however, they pack a lot of punch for a little device. Beside cycling navigation, they are bike computers. These fancy speedometers can display (and record) the basic metrics of your ride. Use them for speed, distance, cadence. Depending on the device, you get more esoteric info, including power, temperature, a measure of ascent and of slope, etc., etc. All that info can be interesting, even engaging if you are on a boring ride. Still, the most practical benefit of a GPS is that it knows where it is and can help get you home. That is a pretty handy approach to cycling navigation compared with stopping and wrestling with a map in the wind when you are tired and hungry. It is also nice to be able to look back later and see the route you actually covered, vs. what you planned. I wish more people had used them in this year’s White Rose Classic sportive. We had a fair number of riders get lost and call HQ for help to get back on track. A GPS could have saved them (and we include GPX files that have the track for all 3 routes). We are working on better signage for next year, but having the route loaded is a safe fallback for all riders. If you are really into it, you can even post your results online to share them with others. Garmin has their own site, Garmin Connect to upload your tracks to. You can do the same with RidewithGPS, a site that you might have used to plot your adventure in the first place. It is a great site for monitoring your cumulative totals. The most sharing popular site, however, is Strava. After your ride, upload the track to Strava and, like in Facebook, others can see what you are doing and give you “kudos” (Strava’s form of “like”). Likewise, you can see what your mates are up to. In a way, posting to RidewithGPS or Strava is like taking out an OS map at the cafe after a ride and showing your friends where your ride went. But unlike an OS map, the track you uploaded comes with a lot more data. That includes the times that you and others may have completed specific “segments,” e.g. a known hill climb in. All seven named White Rose Classic climbs have Strava segments. But all of that stuff is just icing on the cake as far as using the GPS to find your way. You can use it locally and further afield if you travel with your bike. To me, having a GPS was a great improvement over carrying a paper map… until it did not work right. First few times I used my Garmin something inevitably went wrong. I forgot to start it. I forgot to stop it. More infuriating, it stopped itself. Or it completely froze and I had to figure out how to do a reset or reboot by holding a combination of buttons for what seemed like a ridiculously long time. 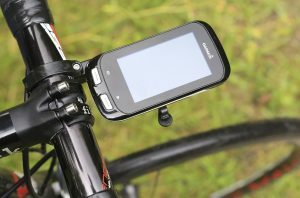 I had a nice Garmin 1000 unit and when it worked, it was great. Besides the times when it failed for a bewildering number of reasons, however, it completely packed up, not once, but twice. That was all within the space of 18 month. Of course, that also meant that the second time it was out of the one-year warranty period. When things went wrong with my cycling navigation, I would pull out my phone and, assuming I had a data signal, navigate home via Google maps. It happened enough that I started to wonder why was I carrying two devices when one is unreliable and the other has a lot more processing power and options (the phone). It took me a while to answer that question, but I do not ride with a dedicated GPS device any more… I use my phone. Hi Scott, I shared your frustration with my garmin Edge 200 and then my 810. The first packed up 13 months after purchase and the 810 after 15 months! But having spent £350 on the 810 with maps bundle I decided to google the issue and discovered Garmin did a refurbishment service. Whilst I begrudge spending the £80 because I feel 2 unit failures just after the warranty period is a pretty poor track record, the thought of binning a £350 unit is even worse. I have to say when the unit works it’s brilliant and I use the route maps a lot both for UK & Europe. And in fairness, I have friends whose Garmins are 5+ years old and still going strong, without any mishaps. It may not be everyone’s idea of a solution, but it’s worth checking out. True enough – many people have good experience with their Garmins. I completely agree, as well that when it worked, it was like magic, particularly when compared to the era of paper maps. Part of my frustration has been that all along I felt that carrying two devices, my phone and the GPS, was overkill. Whereas the GPS couldn’t do what the phone does, I always suspected that reverse to be true. I know that my phone has more processing power, more memory, and a lot more options than the dedicated device.. So why carry the latter?